Adams Autoworx is your Castro Valley Subaru Forester specialist. Whether you need minor oil service, extensive repairs, or major manufacturer scheduled maintenance, you can count on us to keep your Forester in top shape. 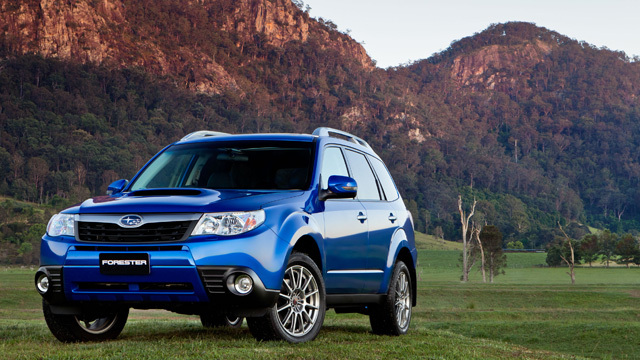 Subaru Forester is known for its excessive oil consumption, but generally it’s a pretty trouble free car that provides years of fun driving experience. Nevertheless, regularly checking your Forester’s oil level should become a habit. When you bring your Forester for an oil service to Adams Quality Auto Care, we will not only change the oil and filters, but will also do a 30 point inspection to try to catch any trouble before it fully develops. Regular maintenance, and use of synthetic oil, is the best thing you can do for car longevity. We recommend synthetic oils, as they tend to stay “slippery” longer helping your engine last longer. Your Forester needs regular oil service, and we are happy to schedule them with your convenience in mind. It also needs major factory recommended maintenance services. Those should be done pretty much at the mileage indicated by the manufacturer. In particular, Forester timing belt, coolant and water pump replacement should be done when prescribed to prevent major breakdowns and costly repairs. At Adams Quality Auto Care we strive to “maximize your transportation dollar”. So give us a call or schedule an appointment online. Our mission is to serve you.